29 January 2015 – Problems in local governments financing system in Montenegro are in the focus of interest of local governments and its association, as well as the Government of Montenegro and line ministries. 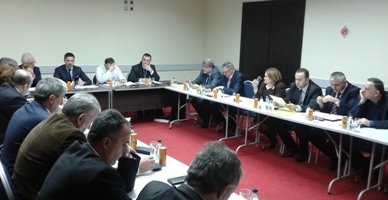 This is supported by two meetings on this topic which were organized on 1/29/2015 in Podgorica as a continuation of activities started at the end of last year. 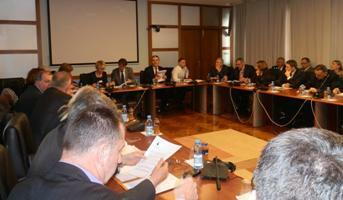 The first meeting gathered Mayors and Secretary General of the Union of Municipalities in order to determine a unified position on the Document on proposed measures for overcoming the difficult local government financial situation adopted by the Union of Municipalities Executive Board in December 2014 and submitted to the Government of Montenegro and line ministries. All mayors once again unanimously supported the identified measures, with a further proposal to find a solution for the payment of income taxes and insurance contributions for the employees who are entitled to retirement, which is rated as important in terms of reducing the number of employees and agreed to joint participation by these issues at a meeting with the line ministers. After this meeting, Minister of Finance Mr. Radoje Zugic, PhD and Minister of the Interior Mr. Rasko Konjevic, MSc held a meeting with the mayors and Union of Municipalities̀̀̀ representatives, in order to define the next steps for the remediation of the financial situation and ensuring the conditions for the smooth local governments functioning. It was pointed out that the local government is an important segment of public spending and an important factor for overall macroeconomic stability, so it is needed more intensive cooperation between all partners in creating a stable and sustainable financing system in municipalities. Minister of Finance Radoje Zugic expressed the Government’s readiness to meet and assist all municipalities that state their willingness and determination to solve the increased financial burden. But according to the Governments conclusions, the accumulation of new debts, nor irrational and irresponsible budget fund spending will not be tolerated. Minister Rasko Konjevic clarified the obligations established by the Plan of Internal Reorganization of the Public Sector concerning the local government in terms of increasing the work efficiency and rationalization of operating expenses, along with optimization of the number of employees in local government and the release of redundant employees. The emphasis is placed on the need to strengthen the transparency and efficiency of administrative procedures. The Secretary General of the Union of Municipalities Mr. Refik Bojadzic and Vice President of the Executive Board Mr. Aleksandar Zuric, Mayor of Bijelo Polje, have spoken on behalf of all mayors about Proposed Measures prepared by the Union`s Executive Board. They particularly emphasized the importance of Government support aimed at resolving the crucial questions on which depends the sustainable functioning of local governments. Special attention was paid to issues related to the possibility of local governments’ debt reprogramming. In this respect it was concluded that the Ministry of Finance in communication with local self-government units will define the period in which an agreement on debt reprogram could be concluded, as well as payment schedule of reprogrammed obligations. Also, for municipalities with limited possibilities of valorization of available resources in the short term, which is mainly related to property, it is proposed to allow them a longer term to meet obligations. In this context, for the purpose of encouraging the development of the most vulnerable municipalities, the Government has started negotiations with commercial banks, in order to enable mentioned local governments to obtain favorable credit conditions and thus to ensure their smooth functioning. Participants agreed on the need to develop a plan for each municipality which would be treated the issue of redundant employees and to provide funds for compensations related to their dismissal. It was concluded that the Working group established by Minister of Finance according to the Conclusions of the Government, consists of representatives of the Ministry of Finance and the Union of Municipalities, should continue further work on defining criteria for debt reprogram, to prepare proposal individually for each municipality, as well as to examine the Proposed measures prepared by UoM for remediation of the situation and ensuring the sustainability of municipal financing, and to submit the proposal to the relevant state bodies. Taking into account seriousness and nature of the problem and the need for continued joint action to resolve it, the Ministry of Finance, the Union of Municipalities and local governments agreed to continue more intensive communication during the following period.